FM Whatsapp Apk Latest Version: Whatsapp Messenger has been improving its features day-to-day. Along with Whatsapp Messenger, Whatsapp Mod Apk are also getting popularized these days. You might have heard about GB Whatsapp which has more features as compared to original official WhatsApp. Nowadays a lot more WhatsApp APK MODs are available, FM Whatsapp Apk Mod App is one such app with lot more features as compared with Whatsapp. Today In this article I am going to share about FM Whatsapp App and Latest FM WhatsApp APK Download links. And also How to Install FM Whatsapp Apk Mods on any Android Smartphone. As this is not available for iOS devices, FM Whatsapp App can be downloaded only on to Android phones. Here in this article, I will share all the information about FMWhatsapp Apk, Its Features and FMWhatsapp Mod Apk Installation procedure on Android devices. Download Fashion Editing Roposo for Pc/Laptop. Like all other Whatsapp Mod’s, FM Whatsapp Apk is also a WhatsApp modified application where you can do a lot more things which we cannot do it official WhatsApp messenger. FM Whatsapp is developed by Fouad Mokdad, As it is newly released and not as popular as other Whatsapp Mod’s most of us don’t know about it. Moreover, it comes under Mod applications one cannot find it in the Google Play Store. Get below to find the latest FM Whatsapp Apk download links. Before choosing this application one needs to complete information about the application. Here I will provide complete information about Updates and Features of FM Whatsapp Apk. Can be installed along with Original Whatsapp App and Run Dual WhatsApp at once without any problems. Theme Customization: Allows users to change Whatsapp default color theme to custom color theme. Privacy Checks: Hide and Freeze Last seen Hide Statuses and Stories. Allows you to add some basic privacy like hiding Blue Ticks, Hide Typing, Hide Recording, Hide Second tick, Show Blue ticks after replying, Anti Delete Messages, Message Scheduling Option. Call Blocker: You can choose who can call you ie. Everyone, My Contacts, Nobody, Selected Contacts etc..
Users can send up to 60 Images at once and large video files up to 700 MB. Added Filters allows users to edit a photo. Available as Emoji and Non-Emoji Variant. Can send a broadcast message up to 500 people at once. Can Set Whatsapp Dp without cropping and can Copy Anyone’s status with one click. These are the existing features of FM Whatsapp Apk. Many more features will go on with the versions. Keep visiting for more updates. As this FM Whatsapp Apk is from Untrusted Unknown Sources we need to make some change in android devices for successful installing. Proceed down the tutorial to download and install FMWA Apk [Fm Whatsapp Apk] on Android smartphone. To start installing the Fm Whatsapp Apk on phone you have to allow installation of apps from unknown sources. Open downloaded file location and click on downloaded FM Whatsapp V7.81 apk. Click on the install button. It will take few seconds to complete installation. After installing the Fm Whatsapp App, Open it and verify with your secondary Mobile Number. Within a few seconds your number gets verified and you can enjoy all the FM Whatsapp Mod Features. 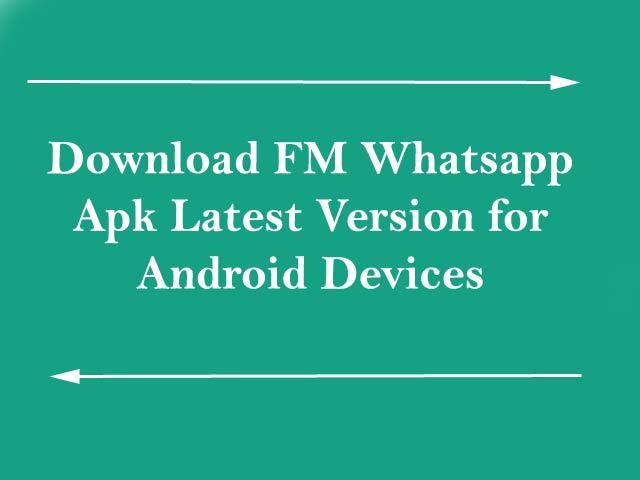 I have given almost every information about FMWhatsapp apk features, also about downloading and installing FM Whatsapp v7.81 apk on android devices. If you have any problems or errors while downloading and installing do share it through comments we will try to solve as soon as possible. Give a try and share your experience and review here which will help others in knowing about FM Whatsapp.